Recently in the news is a story relating to control over Touro Synagogue, located in Newport, Rhode Island. 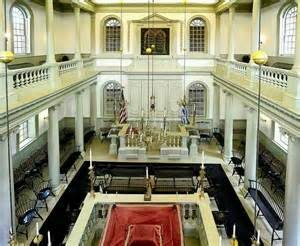 The Touro Synagogue was built prior to the Revolutionary War and is one of the oldest congregations in the United States. As with many older institutions, over the centuries, the original congregation and their descendants eventually moved from the area in question. Many of these individuals settled in New York, and formed a new congregation, named Shearith Israel. The original congregation in Rhode Island dwindled and even fell dormant for a period of time. According to the Court records, there is a dispute between the current congregation of Touro Synagogue, now named Jeshuat Israel, and the New York congregation, Shearith Israel, over who was the rightful owner of the Touro Synagogue, and who has the right to make decisions such as the sale of ornaments in order to raise funds. Our firm has handled similar cases involving control over religious institutions. Many churches and synagogues experience changing congregations and conditions over a long period of time. Depending on the location of the institution, members may move from the area, causing a sharp decrease in active membership. At that point, the institution must decide whether to continue in its present location, or consider moving to another part of the New York where membership may increase. Moving an institution will usually involve the sale of the current location. Such a sale must be approved by the Board of Trustees or other governing body of the institution in question. Prior blog posts have discussed the handling of legal disputes relating to control over a religious corporation. In addition, any such sale of a religious institution’s property must be submitted to the New York Attorney General’s Office for approval. Any congregants who oppose such a sale may have the opportunity to submit written objections to the Attorney General’s Office. A recent change in the law allows the AG’s office to transfer any transactions in which there are disputes to the appropriate Supreme Court part. At that point, a Judge will decide whether any disputed transactions should be permitted to go forward. As the value of New York real estate continues to increase, many older religious institutions may find that they are sitting on a “gold mine,” as the value of the land on which their institution is located may be worth many millions of dollars. If a congregation has dwindled to a small number of people, unscrupulous individuals may attempt to gain control of the congregation in order to sell the property and profit from said sale. That is the reason that such sales must be approved by either the Attorney General’s Office or the appropriate Supreme Court. As in the Rhode Island lawsuit, a Court may have to consider which group of individuals has the legal right to control the institution and make major decisions. In the Touro case, the Judge decided that the current worshippers of the congregation, which has 130 members, should have control, rather than the New York congregation which no longer used the Touro Synagogue. Control over religious institutions is a highly specialized area of the law, and disputes may have major financial ramifications. Our firm welcomes all inquiries in this area.